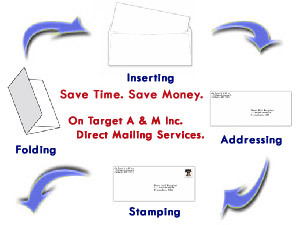 At On Target A & M Inc. we provide a wide range of Direct Mailing Services. From free consultation on mail piece design to complete mail preparation through completed product dropoff. For all your direct mass mailing needs. We can help you drive your costs down when we...print forms customized for each individual in your database, match multiple pieces in your envelope, fold, address, add postage, sort, and deliver your entire completed direct mail campaign mail pieces to the post office. Samples of our Postal Indicia for different classes of mail. Feel free to FAX us a copy of your finished piece BEFORE it goes to production so we can check for proper formatting of Indicia and other elements that relate to your mailing. For more than 25 years we have provided direct mail mass mailing services for commercial and institutional clients nationwide. We have learned a thing or two along the way and we can use our vast experience to assist you and your organization with your direct mailing needs. Even if your needs require Manifest Express Mail, Automated Certified Return Receipt Mail or whatever else you may have thought up, we will work with you to be On Time, On Budget and On Target. On Target A & M Inc. provides a complete range of direct mailing services for fulfillment of direct mass mailings of informational materials and advertising & marketing campaigns for businesses and institutions nation wide. From local businesses to national universities, we offer direct mail services to manage your direct mail design, printing, folding, inserting, posting and database management needs.